Glen Raphael is a nerd-folk performer whose songs cover such topics as quantum physics, bedbugs, gorillas, and the Statue of Liberty's mid-life crisis. His songs are funny, sweet, and touching. 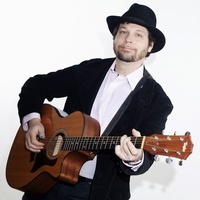 Glen has been featured on the Dr. Demento Show and has performed in many variety shows including TinyDangerousFun!, the Earworm Funny Music Project, The Kong Show, and the Bindlestiff Family Circus Variety Hour. He has won Best Original Song awards at NCSA events and has recorded two studio albums with Mark Dann. You should probably check out his music RIGHT NOW on BandCamp using the links below. This collection of original songs features the pun-filled "Gorilla My Dreams" (as heard on Dr. Demento), a love song with physics ("Quantum Entanglement") and a song in which the Statue of Liberty has a midlife crisis ("Lady Liberty's Pursuit of Happiness"). Glen's newest album includes an ode to bedbugs, a hymn to the Flying Spaghetti Monster, musing on ninjas, thoughts about death, and might even help you win money at blackjack. There is also a Paul & Storm cover and a brief cameo by Nicole Dieker. Cover art by Len Peralta. Lady Liberty is available in digital form at Amazon, iTunes, Google Play, and Bandcamp. Or for a physical CD, try CDBaby. Phase Transition is available at Bandcamp. This is a song about gorillas. Or maybe it's about you. And gorillas. Performed with Nicole Dieker at the On-Air Club during the third JoCoCruiseCrazy. This song is based on the many-worlds interpretation of quantum mechanics, a theory in which every possible universe exists. This was the first time it was performed on stage, at a Brooklyn variety show called TinyDangerousFun. Why is there always a guitar? Questions? Feedback? Send email to graphael@gmail.com or just fill out this form.